Displaying the American flag is a custom and tradition of many families and citizens of America and a symbol of heritage, honor and national pride.. A popular time for displaying the American Flag is during "National Flag Week" which lead up to "Flag Day" on June 14 which commemorates the anniversary of the original adoption of the Stars and Stripes as the official emblem of the United States by the Continental Congress on June 14, 1777. Another popular day for displaying the American Flag is Independence Day on the 4th of July which commemorates the July 4 in 1776 when the USA declared its independence from Britain. There are many guidelines for in the US Flag code for displaying the American flag properly, with respect to the flag itself, as well as to any other flags that may be displayed along with it. Displaying the American flag is prescribed by authority and observed in social or official occasions. It is vital that "No disrespect should be shown to the American flag of the United States of America". The guidelines in relation to giving respect and the displaying the American flag are provided in this article including display in the rain, at night, in a classroom, in church, at home, outdoors, vertically and with a state flag. Refer to the above picture that shows the different parts of the flag if you are unsure of the terminology. The guidelines rules, etiquette and protocol for displaying the American flag in the rain are highly practical. Flags should not be flown during during rain or violent weather conditions, except when an all-weather flags are displayed when flown at half staff. All-weather flags are usually made of nylon or other non-absorbent materials. Flying the American flag at night is fine if it is properly Illuminated. Section 6a of the Code states that "It is the universal custom to display the flag only from sunrise to sunset on buildings and on stationary flagstaffs in the open. However, when a patriotic effect is desired, flags may be displayed twenty-four hours a day if properly illuminated during the hours of darkness." 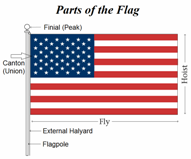 When displaying the American flag at home and outdoors they should always be flown from a flagpole (flagstaff). Do not display the American Flag during bad weather (unless it's an all-weather flag). Never let it touch anything beneath it, including the ground or water. Do not display at night, unless properly illuminated. Do not drape flags over vehicles. Do not wear them as clothes or use them as bedding or drapes. Do not mark flags with any type of insignia, words, pictures or designs. When displaying the American flag outdoors there are a few situations to consider. If displaying suspended over a sidewalk, the union (stars) should be farthest from the building. If displaying outdoors over a street, it should be hung vertically, with the 'union' (stars) to the north or east. If it is suspended over a sidewalk, the 'union' (stars) should be farthest from the building. From a window If displaying outdoors from from a pole or staff projecting from a window, balcony, or a building, the 'union' (stars) should be at the peak of the staff (unless it is at half staff). If it is mounted on a staff that sits on a platform it should placed to the speaker's right (the student's left), and any other flags on the platform should be to the left (the student's right). It may also be displayed flat against a wall at the head of a classroom. It should be positioned so that the 'Union' is always to the left of the viewer. If displaying in a window it should be to people OUTSIDE the school. The 'union' should be to YOUR left as the observer. If displaying vertically in a corridor, the 'union' should be to the left of persons as they enter the corridor or hall. If there are several entrances to the corridor or hall, then the 'union' should be either facing NORTH (in an east / west corridor), or EAST (in a north / south corridor). When displaying the American flag vertically the union (stars) should be at the top to the viewer's left. When displaying the American banner at church the proper placement, lighting and care all need to be considered carefully. When displaying from a flagpole or staff in a church the flag of the United States of America should hold the position of superior prominence. When it is mounted on a staff that sits on a platform it should placed to the speaker's right (the audience's left), and any other flags on the platform should be to the left. The church pennant may be flown above the US flag during church services. Displaying the American 'Stars and Stripes' is part of the US Flags Code was first adopted on June 14, 1923 to coincide with the first American Flags Day. The code provides help and guidance to all citizens regarding American flags etiquette and protocol. The etiquette rules relating to the use and display of the American flags was made law on December 22, 1942. The United States Code allows the President to make any appropriate changes or include any additional rules to the code and protocol.